Brisbane City Council deserves credit for ignoring its own City Plan and approving the development of three new high-rise apartment towers at the old ABC site at Toowong (see Toowong towers nine storeys too high: Labor lord mayoral candidate). I’ve commented previously on the need to boost the population density in inner city suburbs, and particularly in those well serviced by public transport, such as Toowong, which has bus stops, a train station, ferry terminal and access to the Bicentennial Bike-way. Also, regular readers will be familiar with Brad Rogers’s guest post from 2013 on Old Queenslanders in a New City, which discusses the economic costs associated with low population density and urban sprawl, which is more expensive to service with transport infrastructure. As well as the compelling micro-economic arguments for having a more liberal attitude to development, there is currently a good macro-economic argument, as residential building is essential in helping the economy adjust to the end of the mining boom (see Residential dwelling investment crucial to re-balancing of Queensland economy). 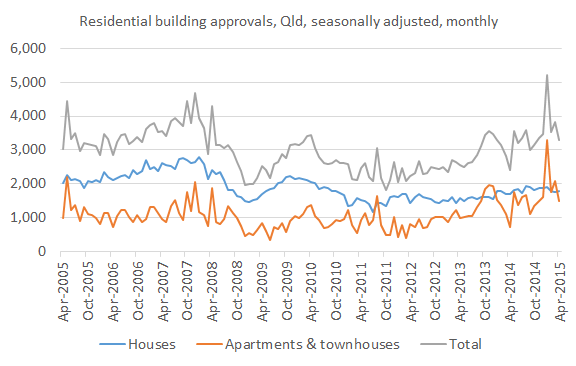 Luckily we had a good start to 2015 with a surge in building approvals earlier in the year, but monthly approvals have fallen back a bit since then (see chart below based on ABS data released earlier this week and see Pete Faulkner’s post on the new data). It remains important, therefore, that councils have a liberal attitude to new developments, and I’m very happy the Brisbane City Council appears to have adopted such an attitude recently. This entry was posted in Housing and tagged abc, bcc, brisbane, development, innercity, publictransport, queenslanders, toowong, urbansprawl. Bookmark the permalink. I agree that the three Toowong towers will be good for the area. There is however an emerging issue with insufficient capacity of the local eateries to provide enough seating with the current Toowong Village upgrade only expected to provide for some of that extra demand. There are at least 10 apartment building projects due for completion in the next 1 – 3 years within walking distance of the main shopping area with at least 3000 apartments meaning at least an extra 5000 people likely to be looking to a place to eat and shop on a regular basis. This makes the development of the Woolworths site critical where a “centrepiece” building should be constructed with at least 30 levels with a competing “Toowong Village” incorporated into the first “x” number of levels with office and residential on top. The section of Sherwood Road between the two sites should then be made a mall to allow ease of access between the two developments. That’s a great idea about a mall, Stephen, and a good point about the need for more eateries. The upgrade of Toowong Village was long overdue. The new San Churro was packed last night! The owners of the Woolworths site are planning on a redevelopment, along with the big office block behind it on Jephson St (which they also own). I’d almost guarantee there will be a variation to the development application for the three towers on the old ABC site that includes restaurants / cafes overlooking the river under one of the towers. This is typical of developers that initially submit a relatively innocious application and then incrementally ramp it up (where the marginal yields from the change are high for the developer, but the perceived social cost to the regulator seems low). I haven’t seen the DA for the 3 towers Jim but you are correct it is a typical strategy to vary the DA after consent for the original application has been approved. I do hope the Woolworths site is developed into something substantial. Toowong reminds me very much of the northern Sydney suburb of Chatswood and I believe it should be developed in a similar way. I agree that density is in general quite good, though I suspect like anything there is an optimal mont, above which is become more costly (thinking 5-7storeys seems quite good across a broad area. Above that high cost underground rail etc needed). But I can’t agree with this : “Brisbane City Council deserves credit for ignoring its own City Plan “. Why not ignore any rule that doesn’t quite meet one’s personal judgment of economic efficiency? I murdered that guy cause he was a drag on efficiency. There is an appropriate way to increase density and an inappropriate way. This is the inappropriate way. I also can’t agree with this “there is currently a good macro-economic argument, as residential building is essential in helping the economy adjust to the end of the mining boom”. Sure residential is growing on the back of speculation. It is not growing because of Council decision to approve outside the scope of the plan. These towers will not be built until they are sold, and any sale they make is a sale that another development didn’t make. Yes, there is basically full crowding out here. Further, giving such approvals away for free is probably the worst way to do this. Given the infrastructure requirements for comfortably habitable density, why give up the opportunity to sell the right to build outside the scope of the plan? I mean this developer has no obligation to build the towers – now or ever – and can sell the sit with approval to the next guy. If you want density, why not say that you can have greater density if you complete your buildings in 3 years? Make them actually do it rather than give away valuable right for free and give away the power of when to build. If my suspicions are correct these towers won’t be built for >7years. They have to sell around 300 apartments before they even commit to construction, and I think the luxury end of the market will quietly tank later this year. Just remember, location restriction on development are not quantity restrictions. There is no shortage of approved sites waiting around for sales before construction. Cameron, thanks for your comments. Good point about the lag between approval and construction. I’ll have a think about your arguments and aim to respond soon. I’m reasonably confident we’d get a higher level of residential development if we relaxed planning restrictions because people would see a lot of attractive opportunities that weren’t previously permitted. Cameron is right with his crowding out argument here, and his last point about quantity restrictions. The other “problem” with the approval of those towers outside the planning guidelines is the significant externality it has created. For example, their height will block city views in the streets behind them. Those views have already been capitalised into the prices paid for those houses, and until now, those values have been protected because of the legislated planning controls. Planning controls are rightly there to protect the interests of third parties and avoid externalities occurring. BCC’s decision in this case has delivered a massive windfall gain to the developer, and big costs to some other homeowners that were arguably protected by Council’s own legislative instruments. I agree that some homeowners will be disadvantaged from the Council decision to approve outside the planning guideline (which surprised me a little) but planning controls can change to disadvantage homeowners that have bought into say an apartment complex with a view. A case in point in Toowong is Regatta Riverside apartment complex (187 apartments) across the road from the Regatta Hotel (cnr Sylvan Rd/Coronation Drive). That and others in the immediate area (e.g. Rivers on the Park approx. 120 apartments) were built to 10 levels which I suspect was the planning height limit last decade. The height limit is now 15 levels. No-one owns a view and people should always factor in variations to planning controls when they purchase. Btw, I’m just about to be built out of a great city view however I factored that into my purchase price.